Wasn't that nice? Didn't it grab your attention? (I think I should start the article now) Cog is the language which almost everything in Jedi Knight is controlled by. Want to make that Dark Jedi have no Force powers and be saberless? Want to throw your lightsaber at six enemies scattered across the room? Want to drive a vehicle? It's possible. Anything and everything can be done with Cog. Cog has been compared to C+, Duke .Con files, and something else, probably. So if you have experience editing these, you WILL be able to edit Cog. You WILL NOT try. You WILL do. I have made patches that rip off arms, make the bowcaster shoot lightning bolts (a personal favorite), throw the saber (Although somewhat buggy), and knock all your enemies away from you (Force Repel). To get started editing Cogs, you'll need a Gob extractor (Such as ConMan or JKGob, from www.darkjedi.com), a text editor (Notepad or Wordpad will work), and time. A copy of the Cog Specs (Yes, that was a pathetic self-promotion) would help too. You can find a copy at Inside3D. Assuming you have all of this, it's time to start. xx_ - These cogs, starting with a two digit numeral code, control happenings in a level. (Conveyor Belts, Elevators, doors). Basically, the level's INF. The numbers apply to the level it will be used in. actor_ - Doesn't control what an enemy does in the game (AI's do that). Rather, it controls what happens when certain events occur. class_ - Turrets and sequencer charges are the only things that use class_ cogs. ctf_itemkeycolor - The Capture the flag key. The color is either red or gold. darkjedi_ - Hmm? What are these for? They control the Force abilities, saber colors, and damage reactions. kyle.cog - Controls what happens when you die, start a level, block things with your saber, etc. pow_ - Controls what happens when you get an item. weap_ - Weapons. What they shoot, what ammo they use, if they kick backwards, etc. Save the cog, put it in your resource\cog folder, and play! 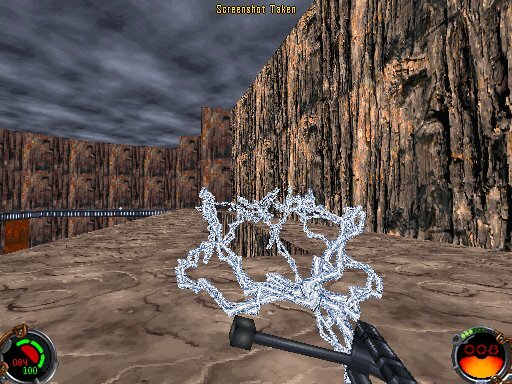 (Remember - Cog patches don't work on saved games) When you charge the bow, it will shoot five lightning bolts at once, like it used to shoot five bolts before. This means, basically, so set your speed to normal plus 1/2 of normal plus half the rank. Change the 0.5 to either make yourself go faster or slower (Give everyone in the game a modified patch that slows them WAY down (Don't tell them). But only if you want to be a bad sport. (I've never done this. ;] *innocent look*) Are you done? Go test it!